Introducing our newest top of the line full HD camcorder with never before seen features. The image quality from the DV41 is, simply put, breathtaking! The HD videos are so crisp, colorful, and vivid, that you will sometimes feel as if you are actually there! This is because the DV41 uses a dynamic 10MP (megapixel) image sensor with a native resolution of 1920x1080. This is the same video resolution used to create documentaries such as Discovery channel’s Planet Earth as well as the hit TV series American Idol. When the pre record function is turned ON, the DV41 will record video for a full three seconds before you even press the REC button! This is the first time this amazing technology has been introduced to the consumer market. This important feature will ensure you always capture those spontaneous moments you didn’t see coming-- as well as provide you with the often forgotten “pre roll” time you will need for video editing. The DV41 comes with 10x optical zoom so you can capture subjects in perfect clarity from far away-- such as small birds in a tree or people hiking to the top of a mountain. The optical zoom does NOT degrade the image quality like a digital zoom will do, so don’t be fooled by large digital zoom numbers, in the real world, optical zoom is what really matters! This is a great way to turn your DV41 into an all-in-one HD security system. Just place it in your bedroom or behind some books in your office and it will automatically record any moving object within the picture frame. This is the perfect way to catch unsuspecting intruders or criminals in the act— or, to simply record yourself without having to press the RECORD button every time. If you’re in the market for a HD camcorder and want one with stunningly gorgeous video quality and professional features such as pre-record and 10X optical zoom, then the DV41 is the right camera for you. The DV41 is currently in stock and ready for single piece or bulk orders. If you order now we will ship it out within 24 hours. Available only from the leaders in factory-direct wholesale electronics, Chinavasion. 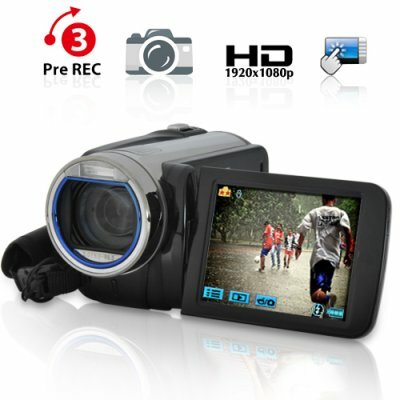 Yes, with the DV41 and the included software you can easily create videos for use with YouTube. funciona y graba con buena calidad para lo que cuesta. El zoom optico de x10 es muy bueno. El unico pero es que el estabilizador de imagen no funciona en 1080i y en WVGA a 60fps. Por lo demas 100% recomendable. Super fast shipping, unit is very light, picture in screen is sharp and clear, works like it dream. Hello to all of you from Greece. The shipping process was done in 12 days.. which was pretty fast. The camcorder is very small and very simple to use i liked it. The video is true hd and the photos are very sharp and realistic. I got a 16gb card and i can record 4.30 hours of video at full hd 1080p and 6500 photos in 16 mp. Très beau camescope avec une très belle image.